The Traffic Subcommittee will meet on a six weekly basis. The Traffic Subcommittee has primary responsibility for considering and making recommendations to Council on traffic matters and consider any traffic matters referred to it by Council. For the avoidance of doubt, “traffic” includes parking and excludes temporary road closures under clause 11(e) of the Tenth Schedule of the LGA 1974 and the Transport (Vehicular Traffic Road Closure) Regulations 1965. 1.1 Regulate its own processes and proceedings to achieve its purpose and objective. The Traffic Subcommittee will have delegated authority to carry out activities within its terms of reference. Monday 15 April 2019 commencing at 3.00pm. 1. Council are asked to consider a request received from Hon Dr Nick Smith, Member of Parliament for Nelson, to endorse and promote the petition of Karen Dow in the name of her late son, Matthew. 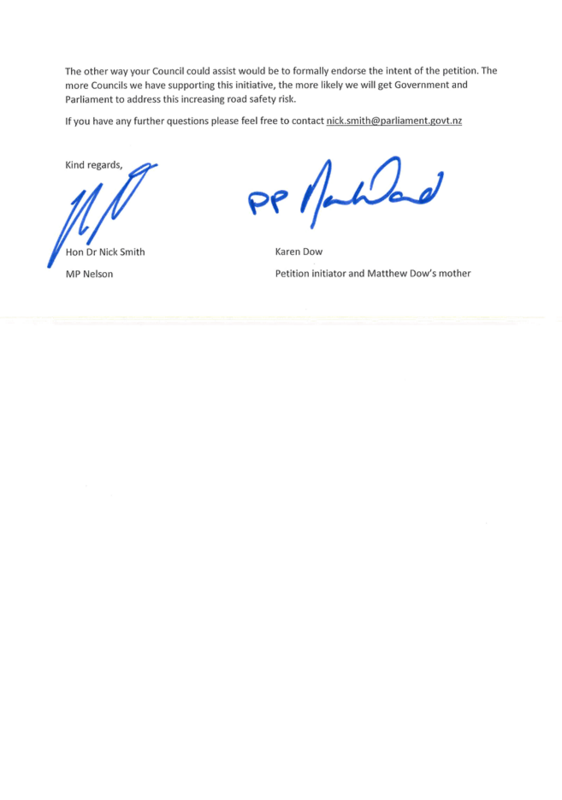 That the Traffic Subcommittee recommends that Council endorses and promotes the petition attached as Appendix 1 to the report, to introduce random roadside drug testing. 3. The Transport Division supports this proposal as a further initiative in addressing the road toll. 4. 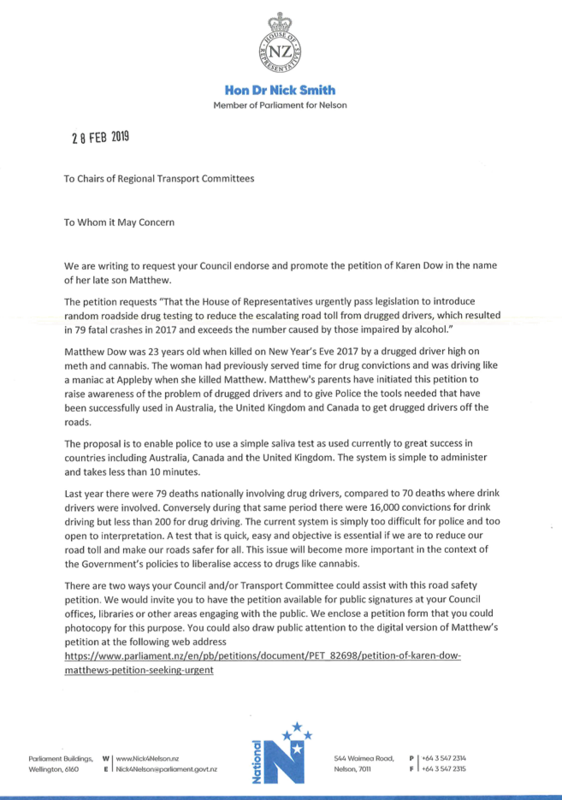 A copy of Dr Smith’s covering letter and the Petition are attached as Appendix 1. 1. The purpose of this report is to seek Council’s approval for the installation of a Mobility parking space with a P60 time restriction, as well as L-bar parking markings and the extension of the existing P60 time restriction in Richmond Street, attached as Appendix 1 to the report. 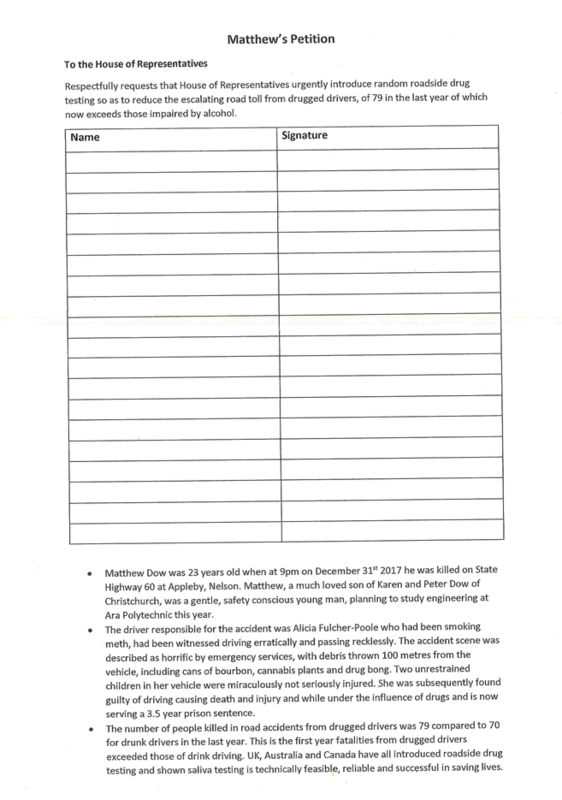 (iii) approves the L-bar parking markings, as shown attached as Appendix 1 to the report. - are supported by the local residents/business that responded to the consultation documents. 2. Council received a request from the Petone Medical Centre to improve accessibility and parking availability on Richmond Street. 3. It was requested that one existing P60 parking space directly outside the medical centre be restricted for mobility impaired users, and that another currently unrestricted parking space have a new P60 time restriction installed. 4. Richmond Street is a primarily residential road with on-street unrestricted parking spaces. The Petone Medical Centre is the only non-residential activity in the vicinity. 5. The requester has indicated that the provision of time-restricted and mobility car parks are essential for patients to have easy access to the medical centre. 6. 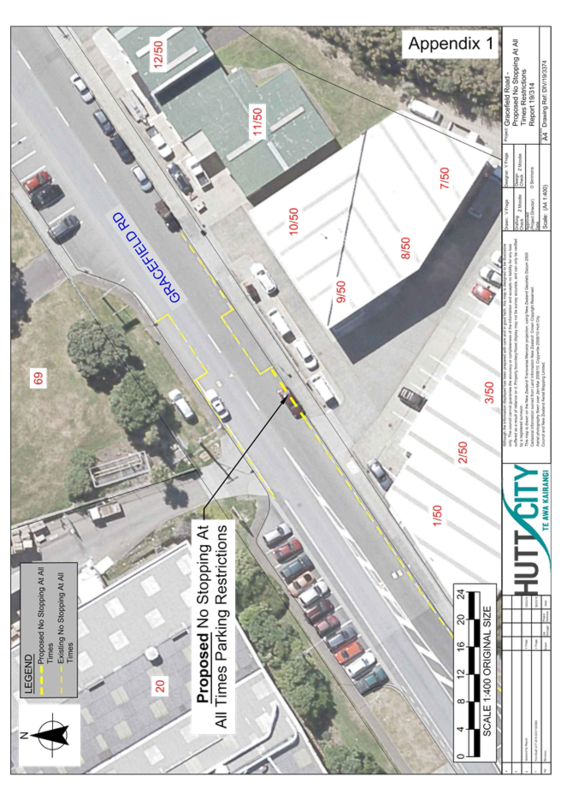 Council officers consider that the provision of a mobility car park on Richmond Street is warranted in close proximity to the Petone Medical Centre. 7. To address this issue, officers propose to install a mobility car park as well as an additional parking space under new P60 restrictions, with accompanying L-bar road markings and signage. The restrictions would be enforceable Monday through Friday, from 8:00am to 6:00pm (standard time restriction hours). 8. This additional parking space would make it easier for patients that need special assistance to find available car parks when attending a consultation at the premises. 9. The proposed measures would result in the removal of one existing, unrestricted on-street parking space otherwise available for residents and visitors. 10. Under the current Concessions for Mobility Permit Holders in the Hutt, for a standard P60 parking restriction, mobility permit holders may park for 120 minutes. c. install mobility and/or time parking restrictions over some greater or lesser extent within the street. 12. Officers recommend Option b. in order to cater for the needs of all road users (including the ones in need of special assistance), at a minimal loss for existing on-road parking availability. 13. Consultation documents were delivered to eight directly affected facilities/residences at Nºs 30, 32, 1-3/34, 35, 37 and 39 Richmond Street. 14. Three questionnaires were returned; two (67%) in favour of the proposal and one (33%) against it. 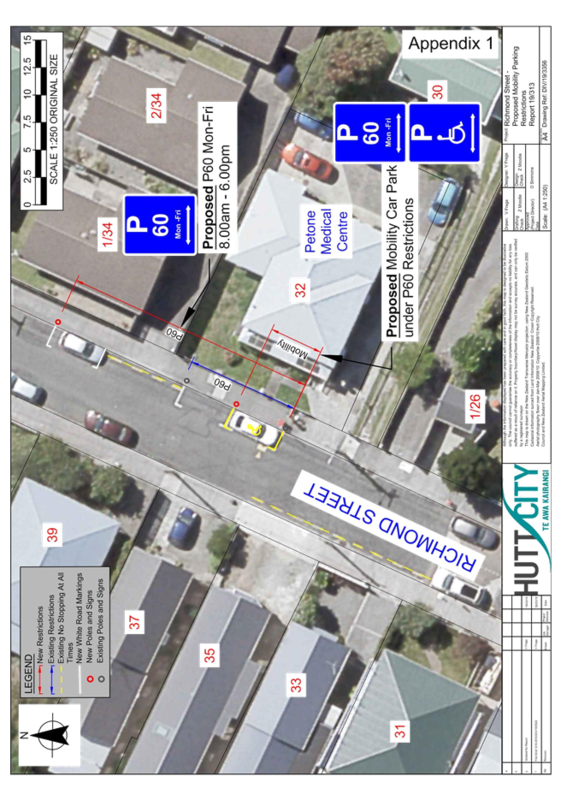 Officer’s response: Based on the feedback received from the Petone Medical Centre (original party that requested the installation of proposed measures), the plan has been amended with the new location for the Mobility parking space closer to their driveway ramp, for easier and safer access. Officer’s Response: There are a reasonable number of parking spaces within walking distance from the resident’s property. In addition, the available car parks within the Petone Medical Centre would not be suitable for a mobility parking space, as this area needs unrestricted access to ambulance vehicles. 17. At its meeting on 8 April 2019, the Petone Community Board resolved to endorse the recommendations contained in the officer’s report. 18. These restrictions are made pursuant to the provisions of the Hutt City Council Traffic Bylaw 2017. 19. These changes can be funded from Council’s 2018/2019 road markings budget. 20. In making this recommendation, officers have given careful consideration to the purpose of local government in section 10 of the Local Government Act 2002. Officers believe that this recommendation falls within the purpose of local government in that it improves accessibility and parking availability for the benefit of all road users. It does this in a way that is cost-effective because it utilises standard road markings. 1. The purpose of this report is to seek Council’s approval for the installation of No Stopping At All Times parking restrictions on Gracefield Road, as shown attached as Appendix 1 to the report. That the Traffic Subcommittee recommends that Council approves the installation of No Stopping At All Times parking restrictions on Gracefield Road, as shown attached as Appendix 1 to the report. - are supported by the majority of directly affected parties that chose to respond to the public consultation documents. 2. Council received a request from a local business to improve road safety and accessibility on Gracefield Road. 3. The concern expressed is that cars parked on the single parking space opposite the driveway for Nº 20 Bell Road South restrict maneuverability when large commercial vehicles enter and exit the vicinity. Due of the size and volume of vehicles travelling down Gracefield Road, this creates a safety hazard for all road users. 4. Gracefield Road is a busy Primary Collector Road which provides access to the Wainuiomata Hill Road and the Gracefield commercial/industrial area. 5. A bus stop is located directly upstream of the existing single parking space which, when occupied, makes it difficult for buses to manoeuvre out of the bus stop. 6. The proposal involves the extension of No Stopping At All Times Restrictions (broken yellow lines) over the single parking space located opposite the driveway of Nº 20 Bell Road South. 7. The recommended restrictions would result in the removal of one on-street car park. 8. The proposed No Stopping At All Times Restrictions in this area would tie into the existing restrictions to the northeast and southwest, and ensure the effective carriageway is free of obstruction by parked vehicles. 9. The installation of No Stopping At All Times Restrictions, as proposed, would improve road safety and ensure the full carriageway width is available for motorists entering and exiting the driveway, reducing the risk for vehicle conflict. 10. The majority of consulted parties that responded to the public consultation documents are in agreement with the proposed measures. b. install the proposed No Stopping At All Times restrictions to improve the road safety and accessibility level of service. 12. Council Officers recommend Option b. which would eliminate the manoeuvrability issues with the loss of a single existing on street parking space. 13. Consultation documents were delivered to 13 directly affected vicinities at Nºs 1-12/50 Gracefield Road and Nº 20 Bell Road South. 14. Two questionnaires were returned, both in favour of the proposal. 15. At its meeting on 8 April 2019, the Petone Community Board resolved to endorse the recommendation contained in the officer’s report. 16. These restrictions are made pursuant to the provisions of the Hutt City Council Traffic Bylaw 2017. 17. These changes can be funded from Council’s 2018/2019 road markings budget. 18. In making this recommendation, officers have given careful consideration to the purpose of local government in section 10 of the Local Government Act 2002. Officers believe that this recommendation falls within the purpose of local government in that it improves road safety and accessibility for the benefit of all road users. It does this in a way that is cost-effective because it utilises standard road markings. 1. The purpose of this report is to seek Council’s approval for the installation of No Parking on the Grass restrictions on Queens Grove, as shown attached as Appendix 1 to the report. That the Traffic Subcommittee recommends that Council approves the installation of No Parking on the Grass restrictions on Queens Grove, as shown attached as Appendix 1 to the report. - are supported by the majority of residents that chose to respond to the consultation documents. 2. Council has received a request from a local resident that restrictions be put in place to prevent vehicles being parked on the grass berms along both sides of Queens Grove. 3. Vehicles frequently park on the grass berms, particularly during the working week when parking demand is highest. This behaviour can damage the berm, particularly during the wetter months, and makes it difficult for Council and local residents to maintain and mow the berm. 4. 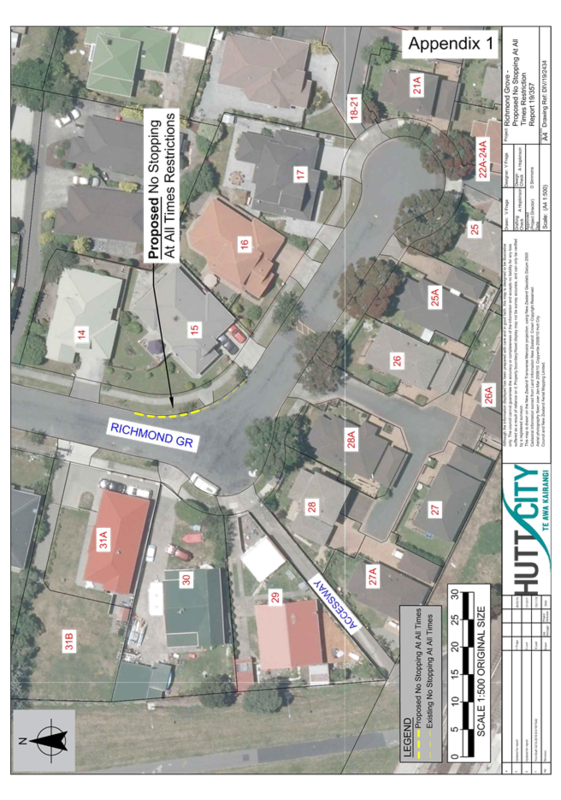 Queens Grove is a residential access street located in close proximity to the Lower Hutt CBD. The northern side of the street currently has P120 restrictions installed, while the parking spaces on the southern side are unrestricted. 5. The general street layout including grass berms is shown below. 6. The proposal involves the installation of a No Parking on the Grass restriction and associated signage along both sides of Queens Grove. 7. Council’s Traffic Bylaw 2017 Clause 12.1(a) states ‘No person may stop, stand, or park a vehicle on a berm, verge, kerb, lawn, garden or other cultivation adjacent to, or forming part of a road so as to cause or be likely to cause damage to the cultivated area’. 8. Although the bylaw prohibits parking on the berm when likely to cause damage, it is often difficult to prove whether a certain vehicle has caused the damage. This means that Parking Services are reluctant to infringe vehicles parked on the grass. 9. Therefore, Council usually seeks a specific resolution for No Parking on the Grass restrictions so that appropriate signage can be installed and enforced. 10. The proposed restrictions would promote compliance with Council’s Traffic Bylaw 2017. 11. Preventing parking on the grass berm will allow regular mowing to be undertaken by both Council and local residents, and reduce the costs of maintaining the berm. 12. There is sufficient free and unrestricted on-road parking on one side of the street and most residences also have off-street parking. The northern side of the street already has P120 restrictions to cater for motorists looking for short-term car parking. This prevents all on road parking spaces from being occupied by CBD commuters. 13. The majority of residents and directly-affected parties that were consulted have expressed support for the proposed measures. c. approve the proposed No Parking on the Grass restrictions to some greater or lesser extent along Queens Grove. 15. Council Officers recommend Option b. which will allow effective enforcement of the Traffic Bylaw 2017 along both sides of Queens Grove. Installing the proposed restrictions to some lesser extent (as it is proposed in Option c.) may result in the migration of illegal parking on the grass to areas not covered by the restrictions. 16. Consultation documents were delivered to 48 directly affected residences at Nºs 46, 46A, A-C/48, 50, 1-3/52, 53, 1-2/54, 55, 1-2/56, 57, 58, 59, 60, 1-2/61, 62, 63, 64, 65, 1-2/66, 67, 68, 69, 70, 71, A-B/72, 1-2/73, 74, 75, 76, 77, 78, 79, 80, 81, 82 and 83 Queens Grove and Nºs 6/6 and 8 Cornwall Street. 17. Fifteen questionnaires were returned; 12 (80%) in favour and three (20%) against the proposal. Officer’s response: Council’s proposed measures does not remove any on-street parking spaces that would be otherwise available for visitors; instead, we are looking to preserve Council assets that have been damaged by parking behaviour in the area. Officer’s Response: Council will communicate with wardens to visit the vicinity more often to provide more effective enforcement over the parking spaces with P120 restrictions. Because the current on-street parking spaces on one side of Queens Grove are unrestricted, more frequent visits from Council officers would not assist in removing the cars already parked there. Officer’s response: Officers will communicate with Parking Services to visit the vicinity more often and provide more constant enforcement over the parking spaces with P120 restrictions. Officer’s response: Council believes there is sufficient kerb side parking available within walking distance as parking bays, and L and T bars parking markings have maximised the number of car parks along Queens Grove. Allowing parking on some, but not all, of the berms would be confusing. 20. These restrictions are made pursuant to the provisions of the Hutt City Council Traffic Bylaw 2017. 21. These changes can be funded from Council’s 2018/2019 road signage budget. 22. In making this recommendation, officers have given careful consideration to the purpose of local government in section 10 of the Local Government Act 2002. Officers believe that this recommendation falls within the purpose of local government in that it improves the conditions of existing Council assets. It does this in a way that is cost-effective because it utilises standard road signage. 1. 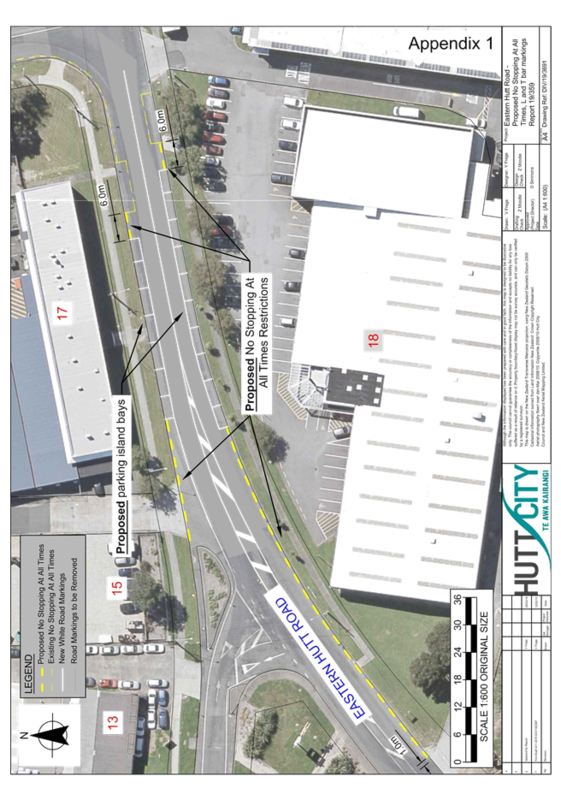 The purpose of this report is to seek Council’s approval for the installation of No Stopping At All Times restrictions on Eastern Hutt Road to accommodate proposed changes to the existing flush median and parking markings, as shown attached as Appendix 1 to the report. That the Traffic Subcommittee recommends that Council approves the installation of No Stopping At All Times restrictions on Eastern Hutt Road, as shown attached as Appendix 1 to the report. - are supported by the majority of directly-affected parties that chose to respond to the public consultation documents. 2. Council has received a request from a local business to improve accessibility and parking availability on Eastern Hutt Road. 3. Eastern Hutt Road is classified as a Primary Collector under the NZTA’s One Network Road Classification system. This section is located in a highly commercial/ industrial area. 4. The concern expressed is that, due to significant business expansion in the area, there is an increase in demand for on-street parking spaces. It was requested that parking bays be marked to encourage more efficient use of the roadside parking space. 5. In order to improve the efficient use of the existing road side parking space, it is proposed to mark individual parking bays in the area. 6. The parking will remain time unrestricted and free of parking charges. 7. There is an existing flush median marked in this location, however when vehicles are parked kerbside it is necessary to travel over the flush median to avoid conflict. 8. It is therefore proposed to remove the existing flush median in the vicinity of the parking spaces and install a solid road centreline instead. This will reduce the risk of vehicle conflict on the flush median. 9. No Stopping At All Times restrictions are required to prevent vehicles parking between the proposed parking bays and adjacent bus stops, to stop parked vehicles restricting driveway access, and to prevent parking on the curve to the southwest of the site (Refer Appendix 1). (1) A driver or person in charge of a vehicle must not stop, stand, or park the vehicle on any part of a roadway so close to any corner, bend, rise, dip, traffic island, or intersection as to obstruct or be likely to obstruct other traffic or any view of the roadway to the driver of a vehicle approaching that corner, bend, rise, dip, traffic island, or intersection unless the stopping, standing, or parking is authorised by signs or markings maintained by the road controlling authority. (1) A driver or person in charge of a vehicle must not stop, stand, or park the vehicle so as to obstruct entry to or exit from any driveway. 11. The proposed measures are supported by the majority of local businesses that chose to respond to the consultation documents. 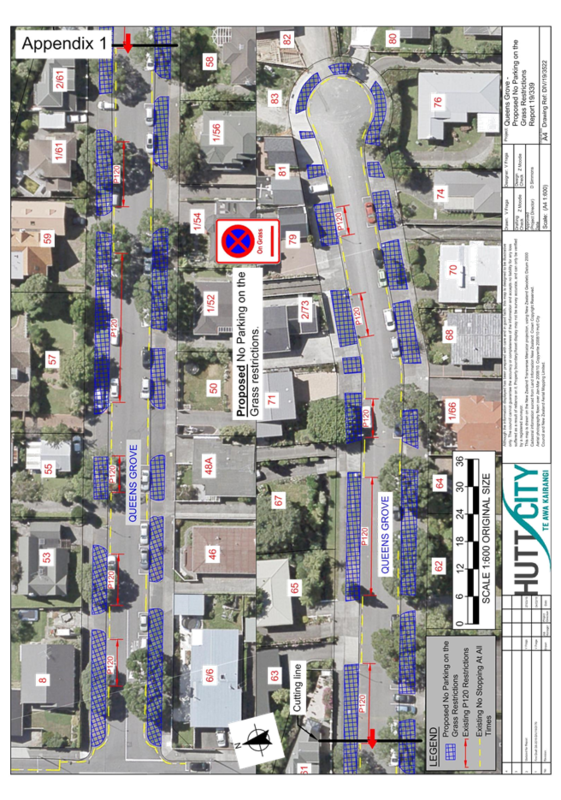 b. install the proposed No Stopping At All Times restrictions, to facilitate the proposed parking and road marking improvements, to improve the accessibility and parking level of service. 13. Officers recommend Option b. as this would improve accessibility and parking efficiency in the area. 14. Consultation documents were delivered to four directly-affected businesses at Nºs 15, 17, 18 and 20 Eastern Hutt Road. 15. One questionnaire was returned by the original party that requested the proposed measures, in favour of the proposal. 17. These restrictions are made pursuant to the provisions of the Hutt City Council Traffic Bylaw 2017. 18. These changes can be funded from Council’s 2018/2019 road markings budget. 19. In making this recommendation, officers have given careful consideration to the purpose of local government in section 10 of the Local Government Act 2002. Officers believe that this recommendation falls within the purpose of local government in that it improves accessibility and parking availability for the benefit of all road users. It does this in a way that is cost-effective because it utilises standard road markings. 1. The purpose of this report is to seek Council’s approval for the installation of No Stopping At All Times parking restrictions outside 15 Richmond Grove, attached as Appendix 1 to the report. That the Traffic Subcommittee recommends that Council approves the extension of the existing No Stopping At All Times parking restriction for a distance of 11 metres to the north of the existing restriction on Richmond Grove, as shown attached as Appendix 1 to the report. - would improve the safety of the access for the affected properties. 2. At its meeting on 13 November 2017 the Traffic Subcommittee asked officers to review the installation of the ‘No Stopping At All Times’ restriction in Richmond Grove approximately 12 months after installation. 3. Council officers contacted the original requestor in January 2019. 4. The requestor advised that the new Broken Yellow Lines did not go far enough to the north, and that there was still an issue with a neighbour’s truck parking at the northern end of the existing markings but still too close to their driveway. 6. The requestor also indicated that their neighbours were also having access difficulties – principally when leaving their driveway. Again, the problem relates to the parking outside the requestor’s property. 7. The proposed solution is to extend the existing ‘No Stopping At All Times’ restriction a further 11 metres to the north. This should ensure that the requester has sufficient clear visibility to leave their property in safety. The extra clear space should also assist with their neighbours’ access issues. 8. The proposed restrictions would result in the loss of two on street parking spaces, however neither of these spaces are technically allowed under the requirements of the Land Transport (Road User Rule) 2004.
c. install No Stopping At All Times restrictions over some greater or lesser extent in the street. 10. Officers recommend Option b. which would eliminate the accessibility issues with the loss of two existing on street parking spaces. 11. When this issue was first considered, a consultation plan and a covering letter were delivered to the 16 properties in the vicinity of the bend. There were eight replies received (50%). Of those, six were in favour of the proposed restriction, and two were opposed to the proposal (both from the same property). 12. This showed a clear level of community support for the previous proposal, however no additional consultation has been undertaken for this proposal (other than with the original requestor) as the proposed restrictions will simply enforce the requirements of the Land Transport (Road User Rule) 2004. 13. At its meeting on 8 April 2019, the Petone Community Board resolved to endorse the recommendations contained in the officer’s report. 14. These restrictions are made pursuant to the provisions of the Hutt City Council Traffic Bylaw 2017. 15. These changes can be funded from Council’s 2018/2019 road markings budget. 16. In making this recommendation, officers have given careful consideration to the purpose of local government in section 10 of the Local Government Act 2002. Officers believe that this recommendation falls within the purpose of local government as defined in the Act. It does this in a way that is cost-effective because it uses standard road markings.